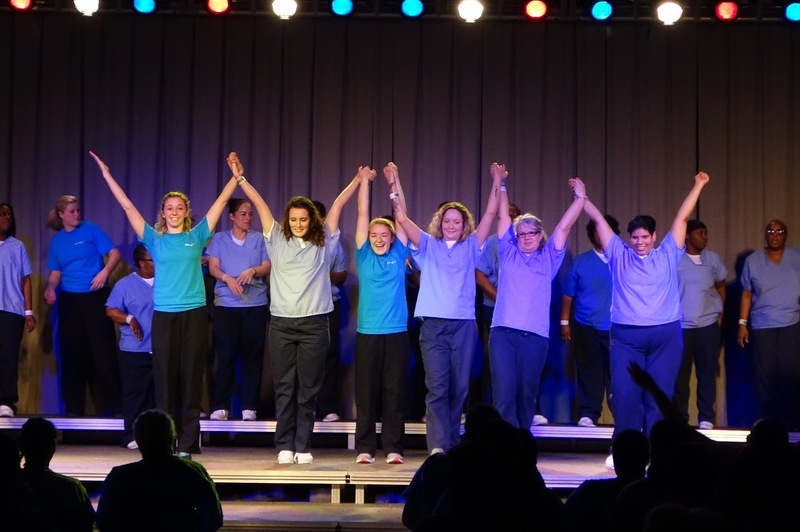 Last week, two Messiah College students partnered with Shining Light Ministries to use dance as a tool in correctional facilities. Hannah Ruskan and Sarah Kistler pictured with the women they worked with at the correctional facility. Senior dance majors Hannah Ruskan and Sarah Kistler never imagined using the arts as a ministry tool for inmates. 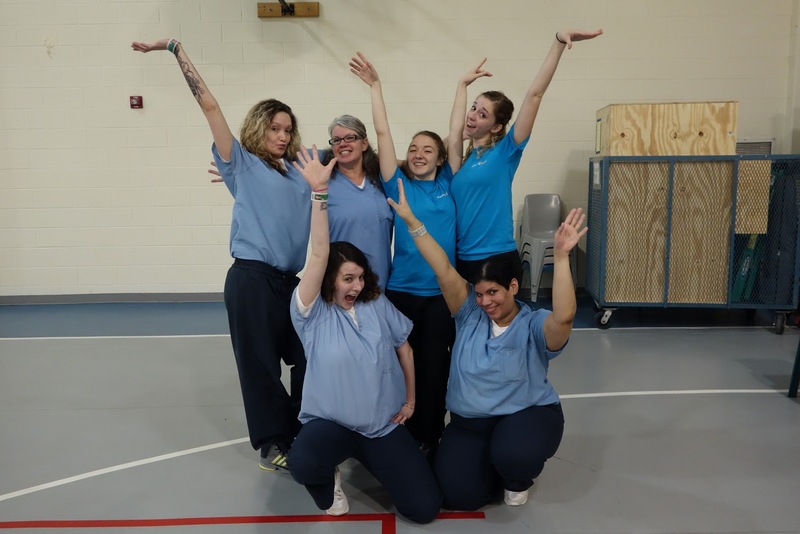 However their lives changed after hearing about Shining Light Ministries based in Annville, PA.
“I never thought of prison ministry as something that I could do. I thought prison ministry was for older men. Thinking about me being a 20-year-old female going into jails was something that never crossed my mind as a possibility,” says Kistler. Shining Light Ministries began in 1996 when Founder and Executive Director Jeff Bohn, started a church performing arts ensemble. In 1999, an opportunity to serve the prison population opened up and the ministry was born from there. “We never dreamed we’d be working in prisons. It’s amazing how God is at work in prisons. To take young people in and give them that experience and then give them leadership roles and leadership training and experience in this kind of situation is just very motivating for us,” Bohn says. Shining Light Ministries began actively recruiting college students from dance, music, and theater departments across the country in 2012. They now do a month-long Impact Tour with twelve 90-minute performing arts presentations called Impact Events, and more recently an Impact Workshop that Ruskan and Kistler took part in. Since first hearing about Shining Light Ministries last year, both Kistler and Ruskan went on different Impact Tours. Kistler’s tour group of about 30 students met in Maine in June 2015. They traveled along the East Coast, performing at different correctional facilities until they reached Philly. Kistler says the dancers performed about six songs with live singers and a band. They covered songs by artists like Lecrae and Skillet. There were also drama sketches and a spoken word poem presented. Ruskan had a similar experience while on the 2014 Impact Tour, in which she was a choreographer and dancer. She describes the experience as life changing, complete with security checkpoints, long set-ups, and talkbacks after the performances. “I got to get to know a population of people that no one wants to associate with and find out we have the same favorite TV shows and ice cream flavors and all these things. People dehumanize people in prison, but we were able to give them back some of their humanity,” Ruskan says. Bohn likes to say Shining Light is about “igniting hope that leads to life change.” That was one of the goals of the recent Impact Workshop. The Workshop featured 35 hours of rehearsal and discipleship over a period of 7 days. It allowed 30 inmates the chance to work with Shining Light artists to produce a show to bring hope to their peers. Besides changing the lives of inmates, the ministry has significantly impacted the students involved. “In the best way possible I went there with the intention of blessing them. In actuality I feel like I was more blessed by them,” says Ruskan. If you would like more information on Shining Light Ministries and the work they’re doing in correctional facilities across the nation, visit http://shining-light.com.